Recent developments in sensors and networking technologies have led to a significant growth in Internet of Things (IoT) devices, such as wearables. They are based on Artificial Intelligence (AI) technologies, such as machine learning, deep learning, computer vision, natural language processing and big data analytics. These advances have led to the development of autonomous systems, such as smart homes, smart cities, smart energy grids and driverless interconnected cars. Will such intelligent IoT systems make all human workforce redundant? Will human beings become meaningless in the future of work? Will AI systems fully replace human beings, or will the IoT rather enhance human intelligence and empower us to solve the most pressing issues of our times in a more satisfying way than we would ever have dreamed of? I argue that effective human-computer symbiosis, often referred to as Augmented Intelligence, has the potential to address some of these emerging challenges successfully, possibly more so than pure AI, at least in the foreseeable future. Augmented Intelligence is defined as computers enhancing human intelligence, while AI commonly refers to computers fully replacing human beings. Much of the hype around the potential of IoT is triggered by purely self-performing, autonomous AI systems powered by big data analytics with data collected from IoT devices. Indeed, the potential of IoT will not materialize without the ability to collect, aggregate and analyze the enormous amount of data created by IoT devices, either by AI alone or supported by human intelligence. Machine learning, natural language processing, data analytics and other AI applications can perform exceedingly well with large-scale data and without human judgement. In contrast, areas such as design of creative marketing ads, personal selling, hiring and mentoring employees, strategic decision-making and treating diseases are prime examples where human judgment, managerial intuition and human-computer symbiosis can still enhance work performance. Human intelligence is still needed to make decisions related to human-oriented data associated with employees, customers and partners that include their preferences, past behaviors, habits, emotions and personalized information. Human beings generally outperform machines when dealing with ambiguity, vagueness and incomplete information, and when requiring emotional intelligence and judgment, elements that are still considered the most critical limitation of AI. Augmented Intelligence integrates the unique abilities of human beings that cannot be replicated by AI, and legitimate concerns about AI have been raised by Bill Gates, Stephen Hawking and Elon Musk, among many other visionaries. Large-scale IoT problems often cannot be solved by either computers or human beings alone. Therefore, there are significant opportunities in IoT applications that are coupled with the notion of Augmented Intelligence. Machine learning approaches and human intelligence should be integrated to keep ultimate human control. Human-computer symbiosis denotes the collaborative interaction between human beings and computers. In the context of IoT, a symbiotic human-computer relationship will emerge when IoT collects the data and AI tools perform the routine data calculations based on criteria determined by humans and prepares the insights to perform evaluations and make decisions. The basic assumption of human-computer symbiosis is that computers and human beings have complementary strengths and problem-solving capabilities. Intelligence is augmented when we optimize the computational power of computers and IoT with the cognition, intuition and “common sense” of human beings. Augmented Intelligence is not a new concept, and it is akin to Human Computer Research on Human Computer Interaction (HCI), but IoT is a new domain for research in HCI. Interestingly, HCI researchers have always warned about the simplistic nature of AI, which views human beings as perfectly rational machines. Rather, HCI seeks to improve the symbiosis between interpretive and emotional human beings as entities and computers to enhance human performance. Many Augmented Intelligence approaches rely on crowdsourced strategies and gamification in the spirit of the HCI tradition. They are able to provide design solutions to Augmented Intelligence that can be applied to IoT devices to enhance the design of human-IoT interaction. All high-tech giants are developing applications to foster Augmented Intelligence. Commercially-available IoT platforms, such as Amazon AWS, IBM Watson and Microsoft Azure are developing fast, and many of these applications resemble an Augmented Intelligence mindset versus being purely AI. Also, Google’s approach to search engine design is akin to the tradition of Augmented Intelligence. These platforms are constantly expanding their scope and reach by adding new technologies and services. One of the most prominent and advanced platforms is IBM Watson. Named after IBM's first CEO Watson, it was created back in 2007 as part of an effort by IBM Research to develop a question-answering tool to compete on a quiz show. Since winning the show in 2011, it has been extended considerably and was commercialized in 2014. 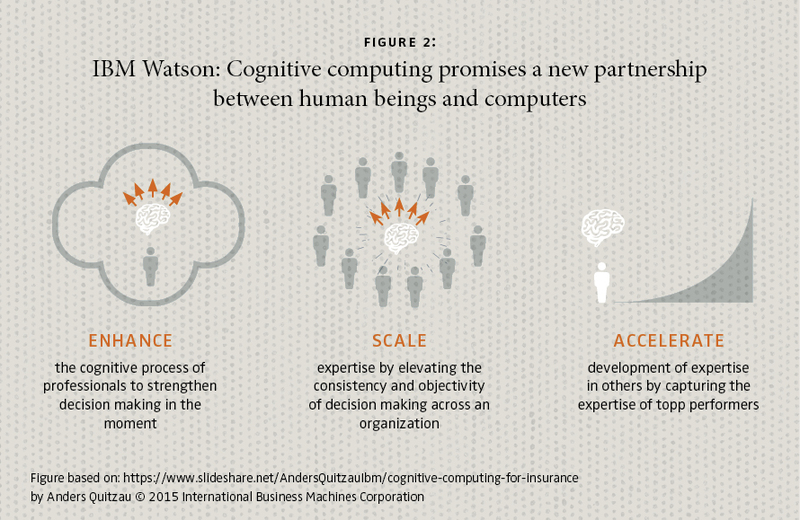 Now Watson offers “cognitive computing” and is designed as a human interface tool for reasoning, decision, language, speech and vision. While existing computers must be programmed, Watson understands the world in the way that humans do: through learning, interpreting and improving based on experience. IoT that enables multiple connected devices to share information and make decisions without human control causes legitimate management concerns: Can AI be trusted to fully circumvent human oversight? Organizations face multiple risks from AI in IoT, such as privacy intrusion, mechanistic decision-making and loss of managerial control. Therefore, managers need to consider carefully for which task, in which way and to what extent IoT applications will be applied. The following guidelines will help managers to reach optimal solutions for leveraging Augmented Intelligence and AI in the context of IoT. Managers can embrace both fully-automated AI solutions and Augmented Intelligence traditions. They must make their choices based on the expected performance, cost and risk of autonomous IoT solutions that would operate without human oversight. For example, automated manufacturing, predictive maintenance and security IoT solutions may be cautiously fully automated. However, human-oriented applications, such as smart retail, could still maintain human oversight. Beacon technology and eye tracking devices can optimize the placement of merchandise, and salespeople equipped with mobile devices can leverage the personalized information from the IoT devices to personally sell products, thereby enriching IoT solutions. Applications of Augmented Intelligence are beginning to emerge in many IoT domains, such as cybersecurity, counter-terrorism, healthcare and space exploration. The interaction between human beings and such IoT applications does not evolve by itself in the most productive way. IoT designers can increase their focus on human-machine interactions and interface points, following an HCI logic, to make the resulting IoT systems more efficient and effective to ease appropriate human control. Managers must engage in a conversation on potential synergies between Augmented Intelligence and AI in the context of IoT. They should strive to effectively combine human cognitive power with computer computational power to design applications of human-computer symbiosis in various industries, such as healthcare, FinTech, cyber-security, smart cities and smart grid, among others. In some distant future, machines alone might dominate decision-making in most applications. There will nevertheless be a fairly long interim during which the main intellectual advances will be made by human beings and computers working together in intimate association. IoT is such an area that can integrate human and computer intelligence to solve emerging problems. Moreover, our society needs to adapt to the broader social, economic, behavioral and ethical implications of AI and Augmented Intelligence. Both affect the future of work, organizational productivity, the blurring of industry boundaries, and other legal, policy, and governance tasks. For the time being, appropriate IoT designs should maintain a reasonable level of human control and oversight and give mankind a chance to get acquainted with delegating control to machines.